RAISE THE FLAG (GB) (Bay 2005-Stud 2010). Raced once. Half-brother to SW Banks Hill. Sire of SW Broadside (Newcastle Gold Cup, Gr.3), Etah James, Parthesia, Yogi, Civil Disobedience, Orepuki Lad, Raise You Ten, SP Princess Brook, Reddito - Rising Glory (Mal. ), Chequered Flag, Unfurl and of Flag the Groom, Crispin, Hoist, Larrikin, Perceptive, Ubin Thunderstruck, Ablaze, Blue Flag, Hilarious, Tommyra, Tony Two Chips, Pamir, Slammer, etc. YOGI (g. by Raise the Flag). 8 wins. See below. Justice (g. by Keeper). Winner at 1400m in Singapore. Firing Line. Winner at 1650m, 3d Taumarunui RC Stewart Browne Group H.
Casanovette. Winner at 1600m in Aust. LINESMAN (Touching Wood). 8 wins from 1900m to 3200m, A$1,079,960, AJC Sydney Cup, Gr.1, St Leger, Gr.2, Summer Cup, Gr.3, Chairman's H., Gr.3, STC Fine & Dandy Welter H., Wednesday H., Waterfall H., 2d AJC Metropolitan H., Gr.1, Moonee Valley Gold Cup, Gr.2, AJC Colin Stephen H., Gr.3, STC Canterbury Cup, Gr.3, AJC Warwick Farm Autumn Quality H., 3d AJC St Leger, Gr.2, Australia Day Cup, L, STC Parramatta Cup, L, Lord Mayor's Cup, L, 4th STC NE Manion Cup, Gr.3. Tempelten (Johar). 6 wins from 2000m to 2200m, NZ$147,225, A$5,940, BOP RC MCL Stuccorite Bay Of Plenty Cup, Te Aroha Cup, Thames Cup, ARC Dunstan Feeds Championship H., Stella Artois H., 2d Waikato Gold Cup, Gr.3, Waikato RC Waikato Thoroughbred Race Horse Owners H., 3d Counties Cup, Gr.3, ARC Dunstan Feeds Championship H., 4th WRC Trentham S., Gr.3. EXCITES ZELADY (Excites). 9 wins-2 at 2-from 1000m to 1600m, A$559,790, to 2017-18, SAJC Breeders' S., Gr.3, Murray Bridge Gold Cup, L-3 times, 2d SAJC RA Lee S., Gr.3, Chairman's S., Gr.3. Linecall (Sir Tristram). 5 wins. See above. GROWL (Montjeu). 8 wins from 1200m to 2400m, A$890,180, HK$264,500, MRC Herbert Power S., Gr.2, TRC Hobart Cup, Gr.3, MRC Heatherlie H., L, VRC Paul Buttifant & Darryl Quilty H., 2d VRC LKS Mackinnon S., Gr.1, 3d TTC Launceston Cup, Gr.3, MRC Naturalism S., L, HKJC Queen Mother Memorial Cup, L.
LEEU (Volksraad). 2 wins-1 at 2-at 1000m, 1400m, Otago RC Champagne S., L, 2d WRC Wakefield Challenge S., Gr.2. Producer. TERRAVUE (Last Tycoon). 6 wins from 1200m to 1600m, A$147,175, SAJC Tokyo City Cup, L, 3d SAJC City of Adelaide S., L.
Race Record: 31 Starts 8-5-3 NZ$1,350, A$603,715. 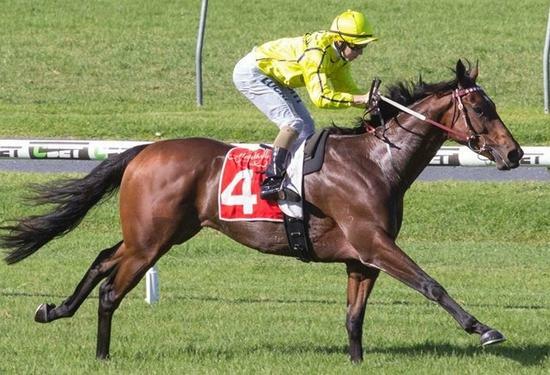 8 wins from 1400m to 3200m, NZ$1,350, A$603,715, to 2018-19, SAJC Port Adelaide Cup, L, MRC Sandown Cup, L, Big Screen Company H., VRC 1 Oliver St P., MRC Le Pine Funerals H., OTI Gen X H., Polytrack H., 2d Warrnambool Cup, L, MVRC Harrolds H., MRC Legacy 2018 Badge Appeal H., 3d VRC Bart Cummings H., Gr.3, MRC Ladbrokes Challenge H., 4th VRC Japan Trophy, L.